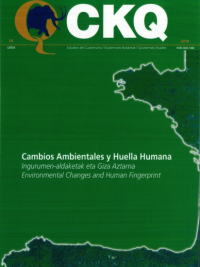 Munibe Antropologia-Arkeologia is one of the journals published by the Sociedad de Ciencias Aranzadi Research Centre, which was founded in 1947 with aim of protecting, researching and disseminating our archeological, ethnografic and natural heritage. The journal is targeted at the scientific community, particularly those interested in anthropological issues. It is published once a year, although each issue is accompanied by diverse supplements. It carries out exchanges also with other similar scientific publications, thereby enriching the bibliographic resources of its library. Munibe Antropologia-Arkeologia is indexed by SCOPUS since 2013, also Anthropological Literature, Francis, Georef and Isoc, and included in the Latindex catalogue. Munibe Antropologia-Arkeologia is a full open access journal. Web users have the right to read, download, copy, distribute, print, search, or link to the full texts of articles. The journal Munibe Antropologia-Arkeologia does not have either article submission charges or article processing charges (APCS).